With that said, the legend is back on the scene, signed to a new label, a new project, and a well placed reunion. After nine years, Wright reunites the New York Fellowship Mass Choir, bringing together some of gospel's finest New York based choirs including Hezekiah Walker & the Love Fellowship Choir, James Hall and Worship & Praise, and Ronnie Felder & the Voices of Inspiration among others. It's Live in New York, recorded at The Greater Allen Cathedral of New York. Even a quick scan of the instrumental players involved quickens the pulse: Melvin Crispell, David Bratton, Eddie Heyward, and the Wright brothers Donny, Dwayne, Dwight, Derrick and David. The first noticeable element of this recording is its production. With Wright at the helm, this project has the feel of a convention rather than a live recording. That atmosphere properly sets the stage for this project. It sounds special. It feels special. It is special. Wright's signature style is found throughout. His ability to take a simple song and make it infectious is a skill that he has mastered. You'll find that to be true on songs like "Miracle" and "There's a Blessing", which features labelmate Dottie Peoples on lead. "Holy Spirit, Have Your Way (Acts 2:17)" also possesses that strength in simplicity, with powerful lead vocals from several choir members including Bettina Pennon-Harris and Evidence Gospel's Kervy Brown. Click on the links below to take you to the Photo Features from Rev. 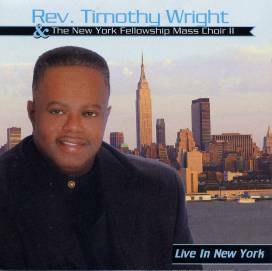 Timothy Wright & The New York Fellowship Choir reunion album recording at the Allen A.M.E. Cathedral in Queens, NY. As you might imagine, the album is chock full of cameos. Keith "Wonderboy" Johnson adds his fiery vocals to "Jesus Is A Friend of Mine" and "For the Rest of My Life (I'll Serve Him)". Pastor Hezekiah Walker returns to the reunion choir and lends his vocals on "United We Stand" (together with Valerie Boyd), which continues his commitment to unity within the body of Christ. 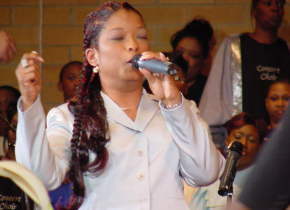 Labelmate Maurette Brown-Clark comes back and joins Wright on "He Lifted Me". Composing nine of the fifteen songs on the project, Wright then lets the remainder of the songs fall into the capable hands of some of New York's finest writers. One absolute gems is "Due Time" written by Melvin Crispell. With Worship & Praise's Tunesha Crispell on lead vocals this song takes on more of a James Hall feel while remaining true to Wright's format. This song begins with the trademark narration of Dr. Kevin Bond and tugs at the heart strings reminding us that our victory will come in God's on due time. "We Will Wait", penned by David Frazier, is another simple yet powerful song brought to life vividly by the compelling vocals of Love Fellowship mainstay Timiney Caton-Figueroa together with her sister Anaysha Figueroa. Add a couple of significant key changes and you have another winner on your hands. You certainly can't forget James Hall's contribution titled "Grateful". Hall also sings lead vocals in this jazzy/churchy groove that is going to stay in your mind for a long time to come. Timothy Wright's ability to fuse contemporary and traditional stylings continues to improve with age. He enlists LFT's Church Choir music director Joeworn Martin to assist as he pens "Nothing Can Separate Me". This uptempo groove features New York favorite Danny Eason on lead vocals and keeps your head noddin' from the opening note until the final fadeout. Elder Wright has done it again with over 79 minutes of stellar music. This reunion features the finest talent in the great city of New York and reminds us to keep our ears open when the "Godfather" speaks. Let's hope that the next reunion doesn't quite take nine years!! All content in GospelFlava � copyright 2003. No information to be reprinted or re-broadcast from this site without the expressed written consent of GospelFlava.com. All rights reserved.